He loved to laugh, and when he did, it was contagious. Pricilla Presley, September 20th, 2014 Facebook. Photo Credit: The Elvis Collection Collectible Cards. C.M. From the research and interviews I have conducted, and the conversations I have had with ETAs, it is clear how seriously ETAs are about their chosen profession as Elvis Tribute Artists. Long hours of rehearsals to get a performance just right, travelling in all types of conditions to make it to a venue on time, trying to earn a living in a very competitive field, and attempting to impress a judging panel that has the power to move your career along are all serious concerns for ETAs. Undeniably, it takes talent, determination, and a strong character to build a successful career as an ETA; but it takes a healthy sense of humour to thrive. Elvis Presley Photo Credit: mirror.co.uk.com via Pinterest. Elvis had a great sense of humour. John Lennon is quoted as saying, "It was his sense of humor that stuck in my mind. He liked to laugh and make others laugh, too." Successful ETAs understand the importance of humour in their performances and interactions with fans. Some ETAs have a natural gift for witty repartee, and can spontaneously inject humorous comments into their performance as the occasion arises. Others, like Elvis himself, have a playful sense of humour. Elvis was known to initiate and participate in well thought out practical jokes. 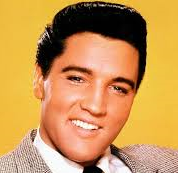 Whether an ETA chooses rehearsed phrases such as, “I hope this suit don’t tear up, baby,” and “Wipe the sweat from my eyes,” or comes up with impromptu humorous interactions with an audience, adding humour to a performance is as much a part of an Elvis tribute as hair, costume, moves, and songs. Elvis’s humorous moments on stage and behind closed door have been well documented. In her book, We Remember, Elvis, author Wanda Hill, shares stories that demonstrate Elvis’s sense of humour. Elvis Presley Photo Credit: Modern Screen, June 1958. Via Pinterest. "One day while I was staying at the Hilton Hotel (in the 1970s), I was outside for some fresh air when I noticed a group of people staring up at the top of the hotel. Curious, I walked over and looked up. Sailing through the air, were several little paper airplanes, and way up on the 30th floor was a tiny figure of a man, waving to us below. It was Elvis, curing his boredom flying paper airplanes and watching the people running after them--after all, Elvis Presley had touched them! What I did not know was that he also put messages on the airplanes, written in baby talk, and he laughed as the people found them and read his messages while he was observing through his binoculars. It was just silly Elvis putting people on again!" Wanda Hill also tells a story that shows the lengths that Elvis would go to get a laugh. The unsuspecting target of Elvis’s joke was a female Hollywood reporter who was determined to get into Elvis’ suite in the Las Vegas Hilton to spy on the ‘wild parties’ she had heard, and hoped, he was having. She wore a disguise to gain access to Elvis’s room. Elvis had been informed of her plan, so he decided to have some fun. Wanda writes: “He hired some Las Vegas girls to come over and had them dress or undress for various roles. He also warned friends who were at the party. When the reporter, in disguise, arrived at his suite, Elvis staggered from his bedroom with a naked woman hanging onto him. He pushed her away, staggered to the coffee table, and said, ‘Clear off the table; who’s up next?’ and he grabbed the reporter. She was horrified (or pretended to be) and told him off. Elvis couldn’t keep a straight face. He cracked up. The whole room exploded in laughter." 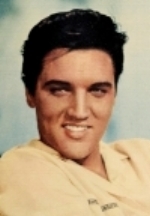 Elvis Presley Photo Credit: The Elvis Collection Collectible Cards. Elvis’s sense of humour is kept alive and well by the many ETAs who have their own moments of hilarity on and off stage. In Elvis, ETAS, and Humour, anecdotes from the careers of ETAs Steve Michaels, Kevin Mills, Matt Cage, Bruno Nesci, Bruce Stewart, and Shawn Klush are highlighted. ETA Steve Michaels Photo Credit: C.A. MacArthur. ETA Kevin Mills Photo Credit: Vegas-to-you.com via Pinterest. ETA Kevin Mills tells of an incident that happened the first time he stepped on the stage in Las Vegas to perform. Quite unexpectedly, Kevin fell to the ground in front of a full house. If not for Kevin’s quick thinking, it could have been a very embarrassing situation. It was during the decade when the catchphrase “I have fallen and I can’t get up” was at its height of popularity. Kevin’s use of the campy and timely phrase was met with rounds of laughter from the sympathetic audience, and Kevin went on to have an excellent performance. ETA Matt Cage Photo Credit: mlive.com via Pinterest. ETA Matt Cage’s DVD, Three Decades of Elvis, recorded at the Empire Theatre in Belleville in2014, is a cache of entertaining comments and behaviour. In his first set he saunters across the stage and gives an approving thumbs-up to his own poster. In the second set, Matt, wearing the ’68 leather suit, says to the audience, “If you see a guy outside with a motorcycle looking really cold, don’t tell him where his suit is, okay. Keep that between just us friends.” And then he adds, “One thing I learned just a minute ago, changing into a leather suit while you’re sweating, ain’t that easy I’ll tell you…I almost worked harder back there, then I did out here. In his third set, Matt, gets a laugh even when he isn’t trying to be funny. Dressed in his peacock jumpsuit, he says, “Thank you very much,” just like Elvis, and everyone laughs. He says, “That wasn’t a joke.” Then he continues, “So what do you think of my suit? I bought it at Wal-Mart—a Rollback Special.” The more exuberant, post intermission, audience prompts Matt to ask, “What did you folks get into at the intermission? Whatever it was, I want some!” After he is given a note about someone’s birthday, he asks the audience if anyone else is celebrating a birthday. So many people raise their hands that Matt comments, “Let’s go back nine months…what was going on? It must have been cold or something.” And when he hears something fall from his suit, Matt makes the audience laugh with his quick wit, “I’m falling apart. I just knocked a jewel off.” Picking up the jewel, he walks towards the audience saying, “There’s fifteen bucks. I’ll tell you what, here you go (handing the jewel to an audience member). You take that, put in a drawer for about 10 or 15 years; and when you take it out, it will still be worth nothing.” The audience found the unexpected twist in Matt's comment very amusing. ETA Bruno Nesci Photo Credit: niagarafallsthisweek.com via Pinterest. Some humorous ETA moments are more visual than verbal. During ETA Bruce Stewart’s show, also at Flamboro Downs, there were lots of laughs when Bruce led a conga line around the floor. Bruce spent more time off stage than on stage that night, stopping by each table sharing one-on-one moments with appreciative audience members, and, in good fun, holding a lot hands and kissing a few cheeks. Bruce's wife, Blaze, joined him on stage for a lively and fun filled performance of Viva Las Vegas, much to the delight of the audience. ETA Shawn Klush Photo Credit: secondhandsongs via Pinterest. I have been at several concerts these past few months and have seen and heard first-hand the humorous actions and comments of the ETAs I have mentioned; however, I haven’t had the pleasure of seeing seasoned ETA Shawn Klush perform live. I was fortunate, therefore, in finding a video of Shawn’s very amusing performance at the Collingwood Elvisfest which fits in nicely in an article about Elvis, ETAs, and humour. It isn’t often that we get to see nine ETAs on stage at the same time where they rely on humour, and not singing, to entertain an audience. In 2007, the BBC aired a special celebrity edition of the game show The Weakest Link where nine international ETAs competed to win money for their favourite charity. Of special interest to Canadian ETA fans, Gino Monopoli from Toronto, Ontario, and Gordon Hendricks from the UK and Germany’s Oliver Steinhoff, who both have Canadian fans and friends through their title winning competitions and performances in Canada, were part of the panel of nine contestants. If you do not know gameshow hostess, Anne Robinson, I am going to warn you that she is known for her acerbic comments. Anne has rightfully earned the nickname “Queen of Mean". The ETAs handle her viper-tongued comments with charm and humour and even silence her when they are given a chance to sing. There are some very funny moments during the program that I hope you enjoy. There are probably hundreds, maybe even thousands, of humorous ETA moments that others have experienced with their favourite Elvis Tribute Artists over the years. I have given a few examples from my own experiences and research. If you are an ETA, or if your are an ETA fan, or if you are connected to the ETA world in any way, I would like to include your humorous stories in this article. Please send your stories to sideburnsmagazine@gmail.com. Thank you very much. Carolyn MacArthur, Editor.